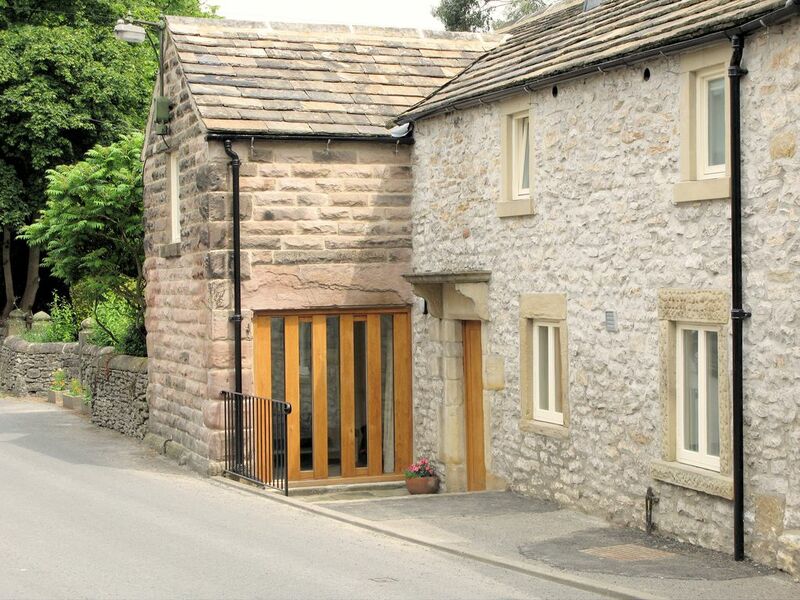 A three bedroomed cottage recently refurbished to a high standard. Sleeps 5/6, full gas central heating. Large kitchen/dining room. Groundfloor w.c. Spacious lounge with wood burning stove. Enclosed garden with fine views across Bradford Dale. Three bedrooms, one double with en-suite w. c., one twin and one single with space for additional folding bed. Youlgrave is an attractive, unspoilt village with excellent facilities and well located for the many tourist attractions offered in the National Park. The name 'Mosstone' was the original name given to the hillside, now known as 'Mawstone' which forms the principle view from the rear of the cottage. The building was purchased by the present owners in 2004 in a dilapidated state and since then has been refurbished to provide a charming and comfortable three bedroomed cottage with central heating. An oak front door opens into the large kitchen/dining room with delightful views from the dining table. The floor is tiled with underfloor heating. One door leads to the garden and a second leads to the utility room/rear porch with space for coats and where the washing machine and tumble drier are located. Off the utility room is a toilet with hand wash basin. To the left of the front door is the spacious lounge with solid oak floor and wood burning stove (logs are provided). French doors open onto the garden and offer pleasant views across Bradford dale to the hills opposite. A long the length of the rear of the cottage is a glass covered veranda providing a useful area to put on and take off boots and to sit and enjoy the warm summer rain. There is a delightful, enclosed garden with lawn, flower beds, patio area and excellent views. A staircase from the kitchen/ diniing room leads to the first floor landing. To the left at the top of the stairs is a twin bedded room with good open views, to the right is the master bedroom with double bed, en-suite w. c. with hand wash basin and with excellent views from its two windows. Turning back along the landing is shower room with large walk-in shower, wash basin and w. c.. The third bedroom, with pitched ceiling and oak beams, has a single bed and a folding bed for use when needed. The cottage is very well equipped. All rooms are comfortably and thoughtfully furnished and decorated. We are confident that you will be pleased with what you find. Tea towels are provided as are hand towels in the shower room and each toilet. Bath towels are not provided - please bring your own. Bed linen is provided free of charge for stays of 7 nights or more with the exception of the Xmas and New Year weeks. For short breaks they are available to hire at £8/single set, £12/double set - or guests may choose to bring their own. Free of charge for lets of 7 nights or more. Christmas and New Year weeks excluded. For short breaks - Monday to Friday or Friday to Monday - £8 per single set, £12 double set or guests may bring own. Youlgrave is an attractive village at the junction of the rivers Lathkill and Bradford. It is an excellent base for exploring the White Peak area by foot, cycle or car and, for those simply wishing to relax offers the peace and quiet of the unspiolt English countryside. There are shops, a garage. a post office and three pubs, all serving food. The pretty market town of Bakewell is a short drive away and there is a regular bus service. Short breaks available, Friday to Monday and Monday to Friday. Tea towels are provided as are hand towels in the shower room and each toilet. Bath towels are not provided - please bring your own. Bed linen(duvet covers, bottom sheets, pillow cases) are included for lets of 7 nights or more. For short breaks the are available to hire at £8/single set and £12/double set or guests may choose to bring their own.